I am unable to use my USB device (e.g. headset, pointing device, gamepad, sd card, Personal Healthcare device etc) in both Mac and virtual machine simultaneously. Is it possible to configure Parallels Desktop to work with my device together with Mac OS X? 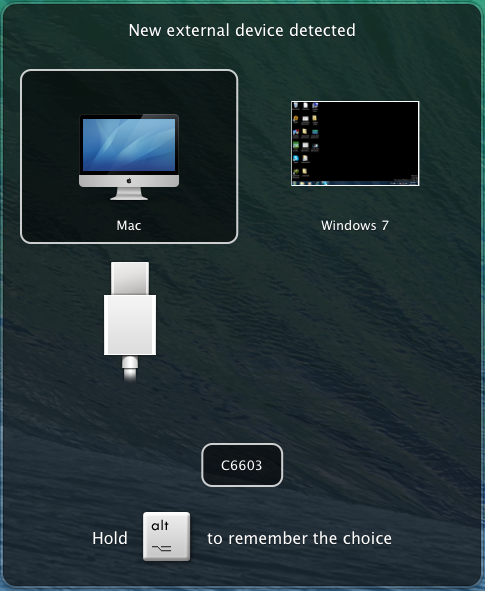 Regrettably, it is technically not possible to connect a USB device to multiple operating systems (to Mac and Windows) at the same time. Despite that, Parallels Desktop provides you with ability to use several types of USB devices in virtual machine without disconnecting them from Mac. These features have been developed by Parallels especially for synchronizing external volumes, printers and scanners with Parallels virtual machines. NOTE: Parallels Tools components must be installed in virtual machine to receive this functionality. Point to Mac and click it if you want to use this USB device in Mac OS X. Point to the virtual machine and click it if you want to use this USB device in the virtual machine you are currently working with. NOTE: If you select to connect the detected USB device to the virtual machine and then reboot this virtual machine, the New external device detected dialog will not appear again after the reboot. The USB device will still be connected to this virtual machine. If device requires its own software for proper functioning, after connecting device to the virtual machine the software should be able to detect the device.